With CORALINE, the MPAA once again proves how little grasp it has in correlating asinine Ratings to actual content. Even as I entered this PG-13 “3D stop-motion” animated movie, there were lines around the block for the premier of the R-Rated FRIDAY THE 13TH, yet I cannot imagine how axe-killing teens could be more chilling than a parallel world where people have sewed-on buttons for eyes! From a celebrated book by Neil Gaiman, director Henry Selick (director, THE NIGHTMARE BEFORE CHRISTMAS) brings us this morbid tale of a cute little blue-haired girl who goes “through the looking glass” (actually, she crawls through a small door in the wall) to a mirror world where her parents do not ignore her (like her real writer parents who are always hunched over computers), feed her delicious dinners (instead of glop), and lavish love on her (instead of what seems like barely tolerable babysitting). Everything is the same but opposite in this Other World – except her Other Mother and Other Father have buttons sewed on in place of eyes. That in itself is something out of a medieval torture tale. But it gets worse. Much worse. And by worse, I mean better. Coraline finds a doll in her new house that looks like her, except with buttons for eyes. 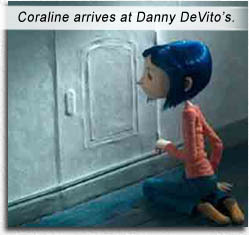 She calls it Little Me, and its secret is revealed soon enough when Coraline discovers her eerie utopian mirror family. There are fantastical musical numbers in this Other World, an especially stunning piano interlude by Other Father (performed by John Linnell of They Might Be Giants). The dark marvels come at us unrelenting, one amazing spectacle after another; it’s not even “darkly funny” – it’s just freakin’ DARK. This movie is apparently the first to be made with this new 3D Stop-Motion process. It is astounding to look at. This is not your LITTLE DRUMMER BOY stop-motion (1968, Rankin-Bass), or even Nick Park’s exemplary WALLACE AND GROMIT (1989) – although an honorary mention must go to the man who made stop-motion an art form, Ray Harryhausen – CORALINE is smooth enough to be a 3D cartoon, yet retains that suggestion of jerkiness that lends it an organic feel. The use of lighting is amazing: shadows moving across a field as if clouds are passing in front of the sun, use of darkness and fog and three-dimensional background turning two-dimensional. We’ve been subjected to the advertising for so long that we imagine it’s “Tim Burton’s” THE NIGHTMARE BEFORE CHRISTMAS, but now we see the darkness might not have been all Burton’s; it was Selick all along who brought the darkness to the celluloid that Tim Burton expressed on the written page. But it’s the parallels with Alice Cooper that are the reason why I need to go back through the looking glass to find my pants. Starring: Dakota Fanning, Teri Hatcher, Jennifer Saunders, Dawn French, Keith David, John Hodgman, Robert Bailey Jr., Ian McShane.